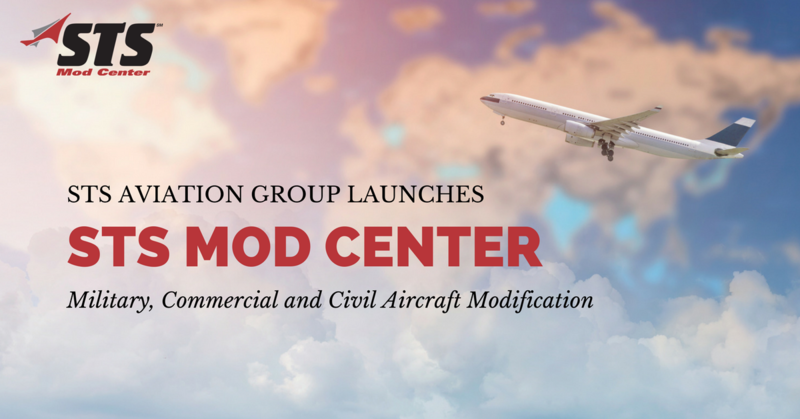 Melbourne, Fla., September 5, 2017 – STS Aviation Group continues its recent expansion by acquiring the assets of AeroMod International to launch a brand new business known as STS Mod Center. STS Mod Center is fully operational and based out of a 114,500 sq. ft., state-of-the-art hangar facility in Melbourne, Florida. The company employs a highly-skilled team of on-site, and mobile, aircraft maintenance technicians and engineers that can expertly accommodate all military, commercial and civil aircraft modification requirements. While STS Mod Center will specifically focus on avionics and structural modifications, what makes the company unique is its ability to provide lower costs and quicker turn times. To learn more about STS Aviation Group and the all-inclusive aviation industry solutions it provides, please visit www.stsaviationgroup.com. STS Aviation Group is a diversified company that specializes in support services for the aerospace industry through its nine divisions, STS AeroStaff Services, STS Engineering Solutions, STS Line Maintenance, STS Component Solutions, STS Air-Pro, STS Repair and Modification, STS Mod Center, STS AeroMod and STS NDT. From staffing your team so it can get the project done right and at an affordable price, to providing certified aircraft and engine components so you can get off the ground and back in the sky, STS continues to be a one-stop servicing center for all of your company’s aviation staffing, aircraft engineering, line maintenance, component sale / distribution, hose manufacturing, aircraft repair and modification requirements. To learn more about what makes STS the company with “Solutions to Keep You Flying,” please visit www.stsaviationgroup.com or call at 1-800-800-2400.